RIDGE SPRING, S.C. – Leagrace Rose Rauton danced into the arms of our Lord and Savior on Sat., July 25, 2015, at GRU Children’s Hospital in Augusta, GA. She was 5 and a half years old. 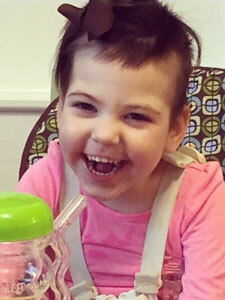 Leagrace passed away due to complications from her rare genetic Urea Cycle Disorder, Citrullinemia. Princess Leagrace was born December, 16, 2009, in Augusta, GA. At 3 days old, she almost died and was diagnosed with the very rare liver disorder. She loved watching Mickey Mouse Clubhouse and Frozen as well as dancing at Palmetto Dance Academy. She loved to watch children play and dance. The Princess traveled to Orlando, FL, in January, through the gracious Make-A-Wish Foundation. She was treated like the royalty she was while staying at Give Kids the World with her mom, brother, Nanny, Papa, and Aunt Jessie. She met Mickey Mouse and all the Disney princesses and characters. Leagrace had a contagious laugh, a gorgeous smile, and huge sparkling brown eyes with long, thick eyelashes. She touched the hearts of everyone she met. People all over the world knew and loved Leagrace. She taught us all how to never take a day for granted and never miss an opportunity to smile. Leagrace is survived by her parents, Anthony and Amber Nichols Rauton of Ridge Spring, SC; brother, River Rauton of the home; grandparents, Mark & Josie Rodgers of Ward, Jimmy & Robin Rauton of Windsor, Theresa & Billy Meador of Ridge Spring; great-grandparents Jim & Rosalyn Pressley of Ridge Spring, John & Jenny Fitzsimmons of Pell City, AL, Dale & Brenda Rodgers of Ward, James & Jenny Rauton of Ridge Spring, and Gloria Boyd of North Augusta; great-great grandmother Letty Lee of Winnsboro, SC; aunt Annalee Rodgers of Ward; uncle Aiden Rodgers of Ward; great-aunts & uncles Tim & Karen Rodgers and Lang and Brandie Rodgers of Ward; cousins Jonathan & Shermaine Watts, Savannah, Taylor, Isaac, & Jon Rodgers of Ward; Ava Watts & Londyn Watts. Leagrace was predeceased by her great-aunt Letitia Fitzsimmons. A celebration of Life will be held Wed., July 29, at 3:30 p.m. at Ridge Spring Baptist Church in Ridge Spring, SC. There will be no formal visitation, but the family is receiving family and friends at their home at 403 East Main St. in Ridge Spring. In lieu of flowers, the family asks that donations be made in Leagrace’s memory to the Make-A-Wish Foundation of SC, 225 South Pleasantburg Drive, B8, Greenville, SC, 29607, or at www.sc.wish.org. The family would like to thank the Children’s Hospital at GRU in Augusta for their constant care, supreme professionalism, and love for Leagrace. One Response to "Leagrace Rose Rauton"
What a beautiful memorial message for such a beautiful princess! I can imagine Leagrace’s joy when the King of Kings invited her to dance on streets of gold, with him, forever. I pray he will comfort you in your time of great loss, and inspire you to rehearse in this life for your own invitation to the heavenly dance celebration made possible through King Jesus. Leagrace will be waiting to dance with you there. For now, may the memories of your little princess dance sweetly in your heart.